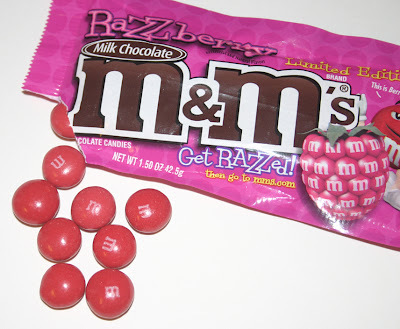 Fellow chocoholics, I have an alert for you: Now is the time to grab a pack of those adorable, tasty, Razzberry "Limited Edition" M&M's (or "Mim-Mims," as my precious 2-year-old niece calls them). DH came home with a couple of packs of these the other night and I couldn't wait to try them. We agreed the M&M candies are actually a mauve color (with a good bit of coral, if I do say so), but the raspberry flavor was quite evident. "Hello. My name is Angela, and I'm a dish-a-holic." You know, it's not like I go out LOOKING for a new set of dishes, but sometimes there is simply no other choice. There's a lovely new antique mall in town I've taken to visiting every couple of weeks or so. About a month ago, I was wandering to the back of the store, empty-handed I should point out, when I saw this little whatnot shelf covered with old ironstone. Hmmm, some Johnson Brothers, maybe? I love Johnson Brothers. 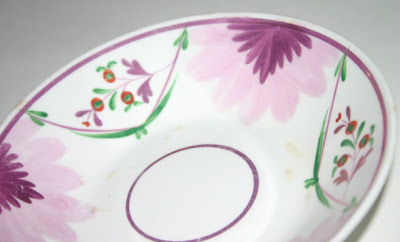 Their "Rose Chintz" design is on my everyday dishes. Me to Nice Antique Store Lady: "Excuse me. I have a question." Me: "Um, there's this set of dishes back there, and the pricetag on the three-tiered server says $22.50 for the set. I just want to make sure they mean the entire set of dishes." NASL (very apologetically): "Now, they're SUPPOSED to put reasonable prices on all their stuff. If that's too much ..."
Me: "Oh, no! That's not it. I don't have a problem with the price, I just want to make sure that really is for everything back there." "Harvest Time. Made in England. A Genuine Hand Engraving. Johnson Bros. Ironstone." Gasoline to go to antique store: $2.73 a gallon. Finding the deal of the season: Priceless! Now everyone knows it's not polite to toot your own horn, but I have to be honest and tell you that I really do get repeated requests for my chicken salad tea sandwiches. Here at the office, folks seem to love it when I have a tea party because they know I always make too much and they will get the leftovers. But it's sort of funny how this recipe came to be. I had read Alexandra Stoddard's wonderful little book "Tea Celebrations" and decided to make her Tiny Chicken Waldorf Cream Puffs. Only I didn't want the sandwiches to be that tiny, and I didn't want to bother making cream puffs. 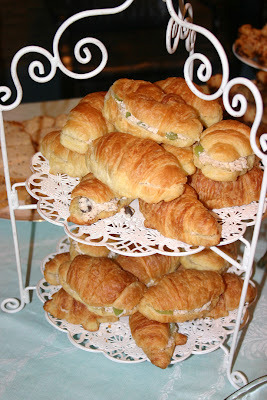 I improvised with miniature croissants and was very pleased with the results. I was getting ready to copy the chicken salad recipe for a friend one day and noticed that the grapes I had always included simply aren't in that recipe! So what made me add them? I don't know. I can only tell you that this is my most-requested tea party recipe, and that the grapes are essential. Almost as essential as the celery seed. So here's the recipe! 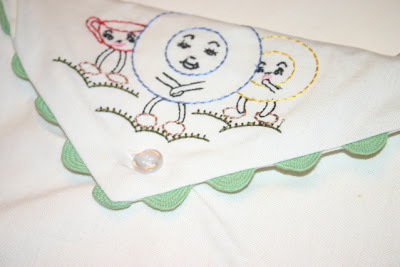 I thought I'd tell you a bit about some of the items in the new blog photos at the top of this page. Like my beloved Brown Betty teapot. 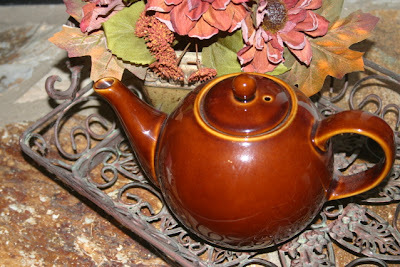 A Christmas gift from my friend Ruth a few years ago, this teapot is the only Brown Betty I own. Currently this classic teapot sits on a decorative metal tray on the hearth in the living room, but like all my teapots, I have indeed tried it out. This is one of the teapots I like using on a cool fall or winter day when I'm going to be enjoying a large quantity of tea. I've read that the Brown Betty is the best designed teapot, but I've heard two different reasons given for this. Some say the clay used to make the pot is the best for retaining heat. Elsewhere, I've read that no, it's simply that the design of the pot works so well in steeping tea. Its round belly allows tea leaves the most amount of room for swirling around and releasing the flavor of the tea. 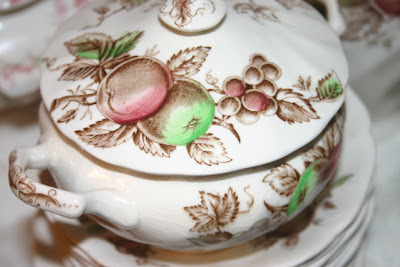 I think my reason for enjoying the Brown Betty is best of all, though: It was a gift from a dear friend! Finally, did any of you watch the Ken Burns documentary "The War" last night? 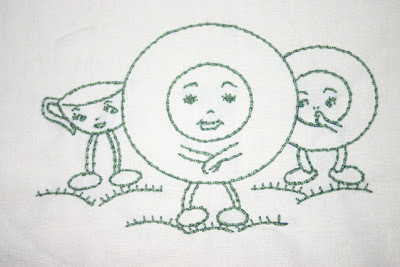 I thought it was quite good, and while I watched, I embroidered that first tea towel with a pretty fern green color. I haven't done plain old embroidery in a while, so I was very pleased with how this turned out! 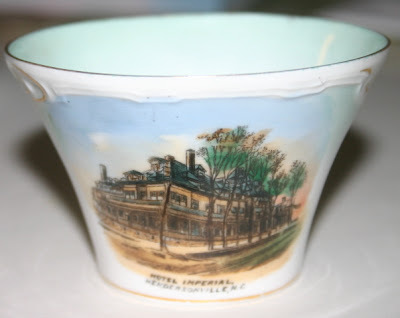 And a souvenir from the Empress Hotel in Canada. 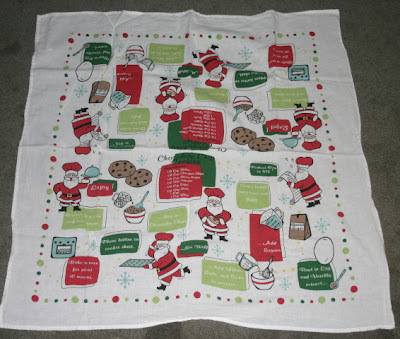 And this one is unique because it's a square tea towel, not rectangular, and features recipes for chocolate chip cookies. 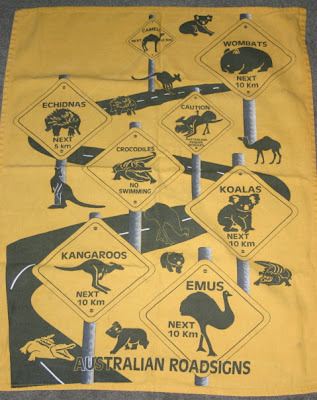 So if you're looking for a unique gift or souvenir, for yourself or someone else, you may just wish to consider the simple tea towel. 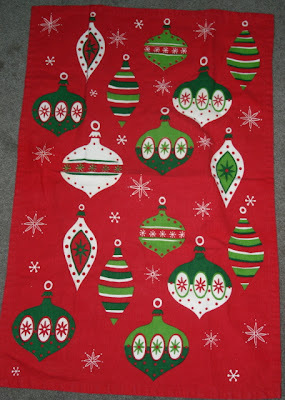 Empty Nest Fabrics and Notions, I was thrilled. I had ordered the tea towels and some gorgeous Moda fabric from her, and the package was waiting on the door step when I got home last night. 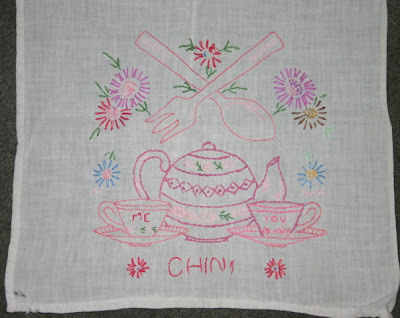 Each of the four tea towels is stamped with a different design, and the fabric envelope they come in was trimmed with rickrack (gotta love the rickrack) and a button closure. I will be finding a special use for this envelope once my towels are all stitched up. One of the great things about making tea breads is that you can vary the recipe and also experiment with the pan size and style. 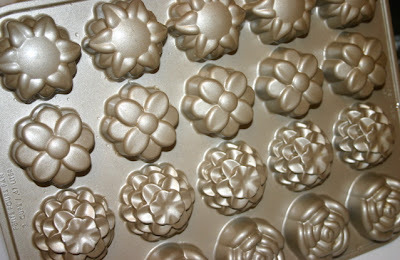 I love my Nordicware petits fours pan, and I use it to bake mini-tea breads that are perfect for teatime. Today's office treat: Pumpkin-Walnut Tea Breads in cute little flower shapes. Preheat oven to 350 degrees and spray pan with butter flavor cooking spray. 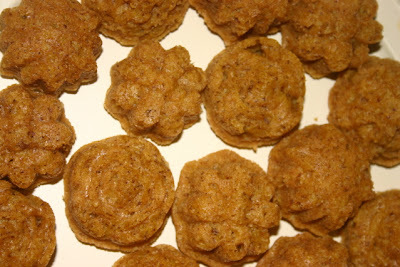 In bowl, stir together flour, sugar, baking powder, baking soda, salt, spices and chopped walnuts. In another bowl, mix pumpkin, eggs, oil and milk. Make a well in center of dry mixture and add liquid ingredients. Stir well, just 'til combined. Fill each "flower" of the pan about 2/3 full (you may need to practice to get this amount just right). Bake for 14-15 minutes or until lightly browned. Remove pan from oven, let tea breads cool a few minutes in pan, then remove and cool them on wire rack. Serve with favorite tea of your choice! NOTE: If you want to bake this in a regular 9 x 5 x 3-inch loaf pan, increase cooking time to 55-65 minutes. As end of baking nears, check regularly until a toothpick inserted in the center comes out clean. Afternoon Tea in Outer Space! Taking tea in outer space! How cool is that! Breakfast this morning: Homemade (by a friend) Muscadine Jelly on wheat toast and a cup of Scottish Breakfast Tea. Yum! And to make that cup of tea, I used another new tea infuser. The Tovolo Tea Infuser I got over the weekend remains my favorite because it works so flawlessly and is beautifully designed. But a well-deserved Honorable Mention in the "tea infuser design" category goes to the "jo!e" Trend Tea Porcelain Tea Infuser. Don't you love the cute little tin this is packaged in? I stood in the aisle at that Homegoods store and opened the top to find this three-piece gadget inside. 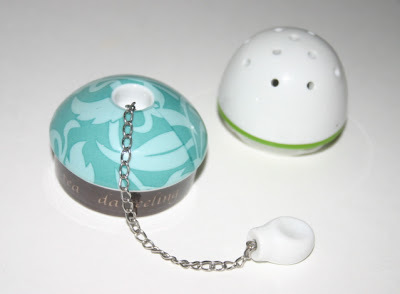 The porcelain tea infuser itself screws together easily, and the little white knob and chain can be used to lower the infuser into your teacup. 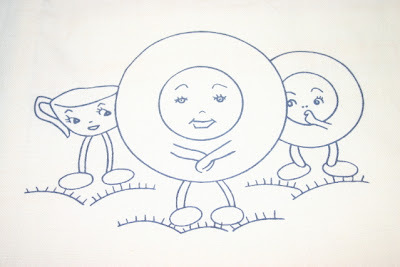 One of my all-time favorite tea books is Emilie Barnes' "If Teacups Could Talk." I often think of that title when I am pondering the origins of a newly acquired teacup. At the end of a day of shopping with my mom this past Saturday, she asked if I had time to stop by a favorite antique mall, to which the answer is always, "Am I breathing?" 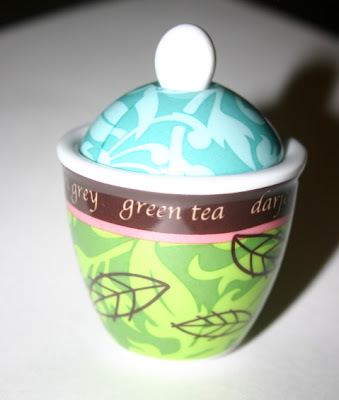 The item that almost immediately caught my eye was this sweet little pale green cup and saucer. The design is actually on the left-hand side of the cup as a right-handed tea drinker is holding it and looking at it. This is one of those lightweight sets that feels as delicate as an eggshell, and it was, happily, also very inexpensive. The design features the Imperial Hotel in Hendersonville, N.C., one of those cute little mountain towns I visited recently. Maybe I saw the Imperial Hotel, or at least its original site? Now, I ask you, precisely how did a cup and saucer set from Hendersonville, N.C. end up at an antique mall in Marietta, Ga.? The bottom of the cup is stamped "B.R.C. Racine Germany." 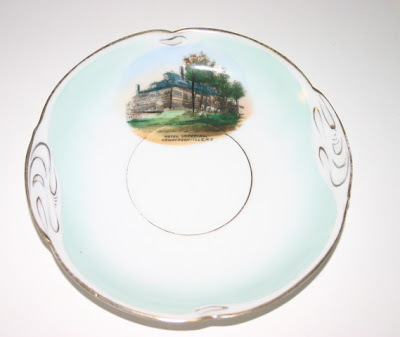 The bottom of the saucer has a very blurry backstamp, but I can make out "Made in Germany for xxxxxerine Jewelers, Asheville, N.C." I asked my husband, "What kind of jeweler in N.C. was able to have cups and saucers made in Germany?" and he said, "One with money." So if teacups really could talk, you better believe I'd have a lot of questions for them! 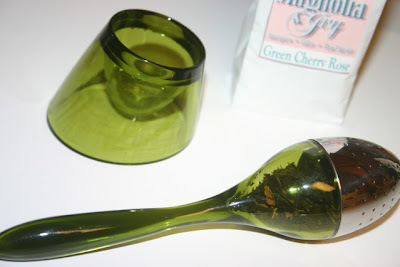 A New Tea Infuser that Works! This weekend I found some wonderful new tea goodies at a Homegoods store (that's the T.J. Maxx sister store that is like T.J. without all the clothes and pocketbooks). 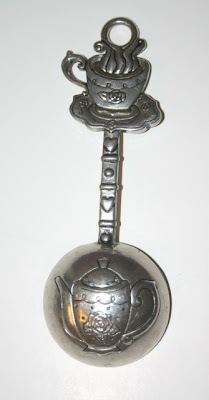 Chief on my list of favorite new finds is the Tovolo Tea Infuser. 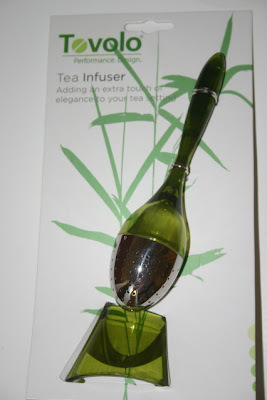 I'd read about this infuser, but you know my rule: never pay retail. So finding the $10 infuser for $5.99 at Homegoods was just dandy. 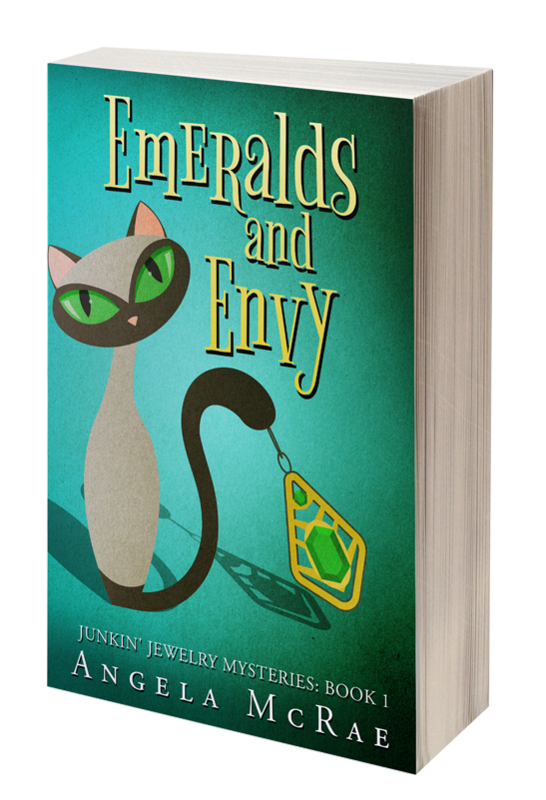 They had it in three colors: an olive green, a deep ruby red and a deep jeweltone purple. No pink? Mercy me! So I settled on the olive green because at least it matches the leaves on the roses on most of my teacups. Any time I visit a new town square I hope to return with something for the tea cabinet, but sometimes you come up empty. Yesterday's shopping was not overly productive, but the visit was certainly memorable all the same. My friend and I stopped by a coffee shop on the town's square and had some OK coffee drinks and the worst scone you can imagine. I was going to cut it and split it with my friend, but the knife crashed into the plate and sent crumbs flying along the table because the scone was so stale. I finally broke off crumbs with my hand, and my giggling friend pointed out that if you pretended it was biscotti, it wasn't so bad. Funny! Yesterday, I bought my first Christmas gifts of the season, so now I'm thinking perhaps this will be one of those rare years when I'm finished by Thanksgiving. (I always hated "those people" until I became one of them.) 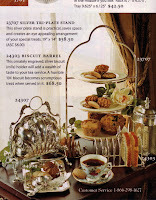 In that spirit, I thought I'd share a few of my favorite catalogs that offer goodies for tea lovers. 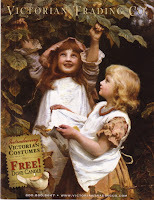 First, always, on my favorite catalog list is the Victorian Trading Co. catalog (victoriantradingco.com). 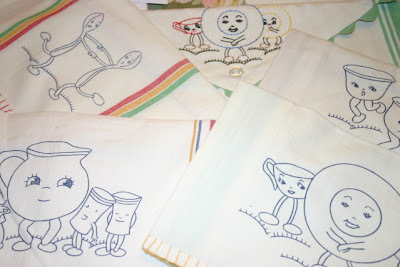 I've ordered their gorgeous papers and calling cards for years, but now they also offer tea sets, sugar tongs, aprons (I have the one with teacups on it), tea cozies and more. My latest wish-list? Their etched cake dome and fancy tea strainer shown here. 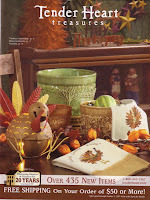 A close second in the favorite catalogs department would have to be Tender Heart Treasures (tenderheart.com). 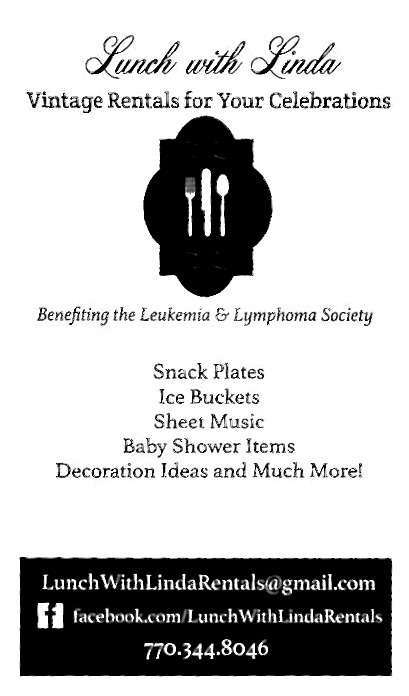 They were pleasant to deal with and accurately shipped all the frilly white tiered serving trays I ordered last year. (These trays fold up, which is a great space-saving feature.) Today, I occasionally see some of their items in T.J. Maxx stores after they've been in the catalog a while. The prices are so reasonable to start with, even T.J. Maxx doesn't offer them much cheaper, but there is that matter of shipping! Happily, Tender Heart's current catalog gives free shipping with a mere $50 order, which you can easily meet. The must-have item for this season? Their new Christmas-tree-shaped dessert server. Gotta have it! Finally, I want to mention the only catalog on this list I haven't actually ordered from yet. 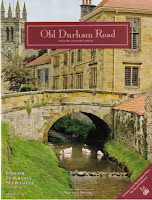 Old Durham Road English Country Living (olddurhamroad.com) is a new catalog for me, but wow, do I ever want lots of these British goodies! My "dream" item is expensive - that silver-plated bun warmer ($125) - but I couldn't enjoy it unless I found it on sale somewhere. 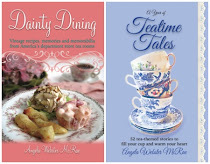 On a more realistic note, there are English teas and jams, some unusual tea sets (one featuring blue and white designs of old tea clipper ships), cookbooks and more, all quite reasonably priced. I imagine I'll have a report on them before too long. And if you have a favorite catalog to recommend, by all means, chime in! Oh, if only the company jet were available today! I'd ask it to whisk me off to Blowing Rock, N.C., the picturesque mountain town I visited over the weekend. It's also the place where author Jan Karon wrote her popular Mitford series of books, and Karon will be guest of honor at "a proper Mitford tea" at the Blowing Rock Country Club this afternoon. Tickets, I learned, are $75, but I would had to have splurged if I were going to be in the area. 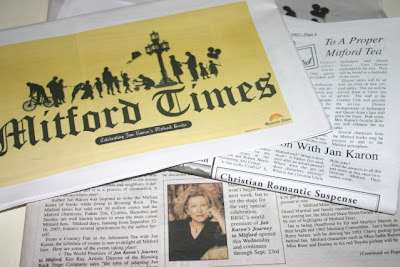 According to the Mitford Times, the cute little tabloid newspaper that's just out in honor of the town's Mitford Days celebration, "Guests at the tea will be treated to a personal visit with Mrs. Karon along with tea delicacies made from recipes published in Mrs. Karon's cookbook. Favors of the afternoon will be special handmade candles with hydrangea and Queen Anne's Lace flowers embedded in the wax. They will be boxed as a keepsake of the event." 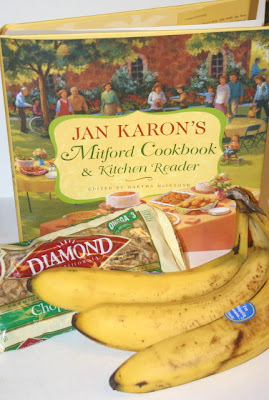 But this afternoon I hope to join these tea-takers in spirit, if not in body, by baking Cynthia's Banana Bread from the cookbook I bought at a "Mitford" bookstore. It calls for plain yogurt, and I'm curious how that will affect the flavor compared with the sour cream I typically use to make banana bread. I have a feeling it's going to be great, and I plan to have a slice along with a cup of tea as I continue re-reading "At Home in Mitford" once I get "at home in Newnan." 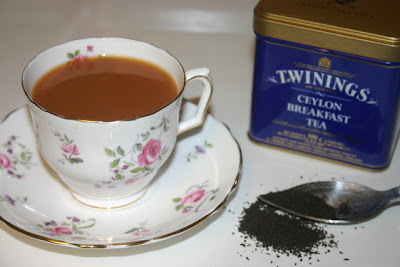 This morning for breakfast I wanted just a cup of good old black tea, nothing fancy, nothing fruity, and so I turned to the blue tin of Ceylon Breakfast Tea from Twinings. I've never seen this tea at any of the local grocery stores, but I did find it at one of the international markets in Atlanta a while back. The first thing I noticed about this tea was the fine, almost ground appearance of the tea leaves. 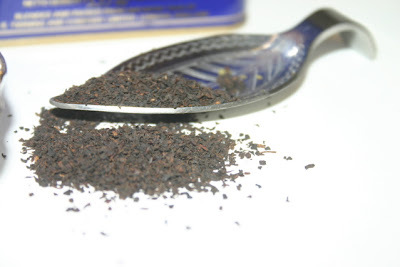 Can you see from the close-up that this tea looks almost like coffee grounds? For that reason, I use a tea sac when making this tea. I knew this would be a very strong tea, so I steeped it for only three minutes and added a bit of milk. Just what I wanted! And the winner is ... #13! "Love your tea blog! 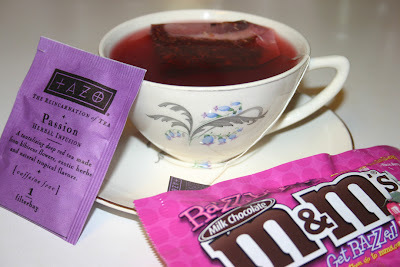 My favorite tea right now is Reba's Orchard - a blend made by the owner of Shady Gables tea room in Versailles, MO." And thanks to all who entered and commented! I so enjoyed reading your comments, and now I'm busy trying to think of an even bigger and better giveaway for the 200th post! Finding Lustreware in Asheville, N.C. Downtown Asheville was such an interesting place. There was the wonderful Grove Arcade, the historically renovated "public market" first built in 1929, where circular iron staircases and marble walls testified to the elegance that must have existed back when this was the home of haberdasheries and millinery shops. There was a tiny but adorable lace shop, Merletti, where I bought a bit of lace said to have been made by women recovering from the tsunami. There were galleries with funky contemporary pieces, beautifully crafted pine needle baskets and carved wooden bowls with a texture as smooth as silk. Down a steep set of stairs, I was delighted to enter Vintage Moon (vintage clothes and teawares were advertised), and although I didn't buy anything, the cheery flapper music playing as I entered put a smile in my heart. I wasn't really on a "mission" with my Asheville shopping, but of course when we spotted an antique store on a side street, and my husband suggested we stop, I was more than happy to oblige. 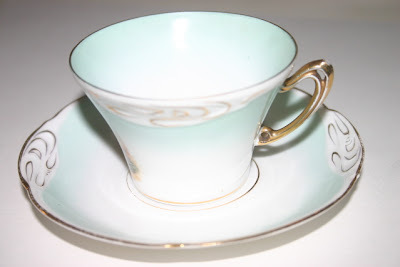 And there it was: the lustreware cup and saucer I have been wanting for years. Years, I'm talking. 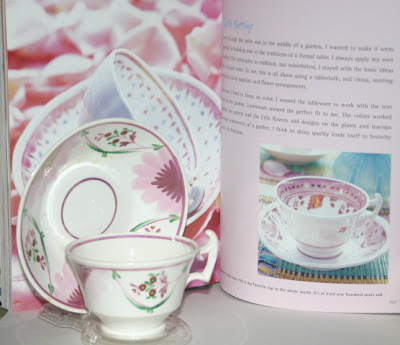 Rachel Ashwell's Shabby Chic decorating books pretty much define my "style," if I even have one, and here's what her 2001 book, "The Gift of Giving," says about lustreware: "The roots of lustreware date back centuries, originally to the Middle East. The shimmer came from glazing pottery with real bits of metal. In the nineteenth century, English potters and china makers began working with the process, but took it a step further by repeating less earthy colors and experimenting with more delicate patterns. 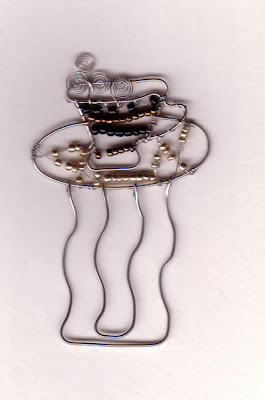 It was still, however, a tedious process that was done by hand. 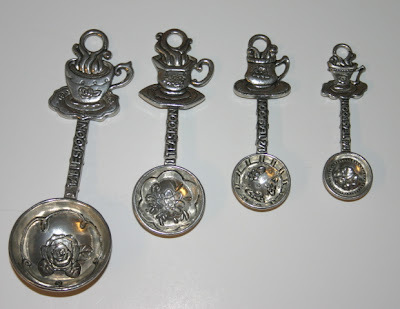 It was applied mainly to tea sets, so those are the most common examples to come across." I have seen lustreware in antique shops only twice before. 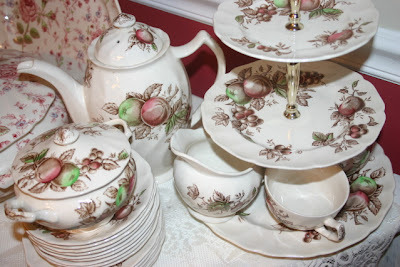 The cup and saucer sets were $55 and $60, which was too much for this cheapskate collector. My set was a mere fraction of that, so I left downtown Asheville with an especially wonderful souvenir. 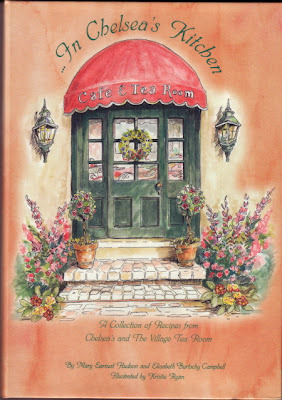 Chelsea's Tea Room in Asheville, N.C.
Have just returned from spending a few days in Asheville, N.C., which included an unexpected treat at a tea room and some very fun tea shopping, so of course I have to share! I know Asheville is the home of Biltmore Estate, which is certainly a must-see if you've never been, but both my husband and I had toured it before. Instead, this trip was to visit the downtown Asheville galleries, local shops and some of the smaller outlying towns. One of the tourism brochures touted Biltmore Village, which is a quaint shopping area where DH had kindly agreed to wander around while I visited the three shops I particularly wanted to see. 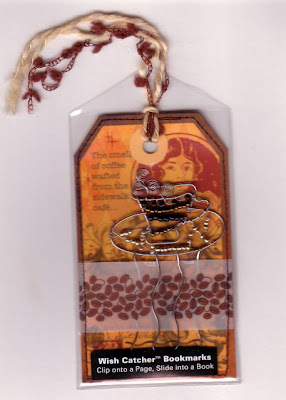 My first stop was Recollections, located in a pretty old house and filled with tea goodies and several cases overflowing with that lovely Dee Sharp tea-themed jewelry. (I'd bought a ring design of hers at World Tea Expo.) Turns out this used to be Dee's shop, the shopkeeper told me. I got some Harney Chocolate Mint Tea and a new infuser basket and merely lusted over the gorgeous floral paintings by Christie Repasy, whose work has been featured in Romantic Homes and other magazines. Next was a yarn shop, but it was my third of the day and I had already met my yarn needs. Finally, I was at Chelsea's Tea Room. It was too early in the day for afternoon tea, so I was happy to simply look around and shop for a while. Imagine my surprise when my thirsty husband waved me in to join him on the patio, where he was looking over a menu and indulging in what he said was some very good plum-flavored iced tea. Well, you don't have to twist my arm to get me to enjoy a new tea room! We agreed to split a dessert, and we got the White Chocolate Lemon Curd Layer Cake. When it arrived, there were audible gasps from the other guests out on the patio. This three layer mega-slice was just delicious, and I'm so glad we had decided to split it. 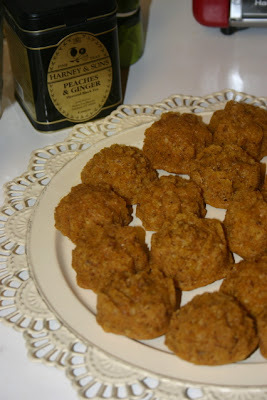 In fact, when I realized the recipe was in the tea room's cookbook, I left with a copy and hope to bake this treat myself sometime! REMINDER: If you haven't yet left a comment on the Sept. 4 post, please do so before noon tomorrow so you'll be entered in the tea giveaway! Even among my favorite magazines, some issues are better than others. 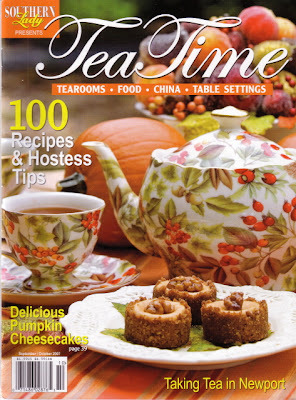 The September/October 2007 issue of Tea Time is one of the best yet. I'm longing for fall, and this fall-themed issue is making me even hungrier for the season to arrive. 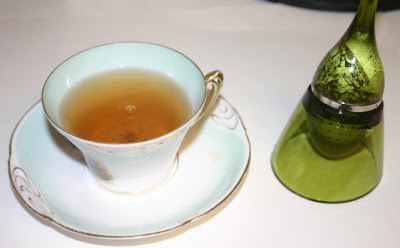 For the tea party enthusiast, there are ideas for a Back to School Tea, a black and white tea (not my normal color palette, but this one is very elegant), and an idea I do intend to try: A Progressive Tea Party. Overall, this was just a very fun issue of the magazine. 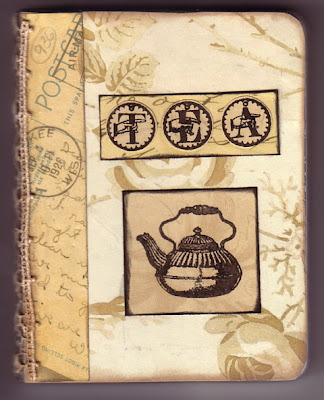 The other night when I made the tea journal for the giveaway, I made a new one for myself as well. I used stamps from the Mad Tea Party line by Catherine Moore (see characterconstructions.com for the full line). The set I chose appealed to me because it had the whimsical teapot-headed lady as well as some letters spelling "TEA," a tea kettle, a spoon and a few more designs. 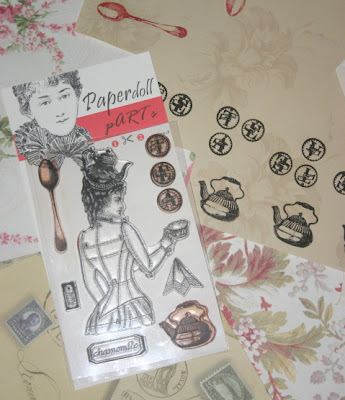 Because I am a sometime scrapbooker, I had plenty of pretty papers from which to choose. I tend to favor papers featuring vintage handwriting and postage stamps (gives the look of old letters) and the pretty floral designs of Anna Griffin. Once I glued my papers and stamped designs on the cover, I inked the edges of the mini-notebook. I like giving the edges a bit of a vintage, distressed look. I thought these little journals turned out so well, I bought two more of the mini-composition books and may make more tea journals for friends. My new tea journal is already tucked into my purse, where I can pull it out at any time. I've already used it to list some ideas for future blog posts. As with my old tea journal, I will use this one to list such things as teas I've tried and wish to try, tea books I own (so I won't buy a duplicate by mistake), notes about tea rooms I've visited (you can sketch a tea room's presentation that you really like), and more. If you haven't tried keeping a journal devoted entirely to documenting your own tea experiences, I highly recommend it! At my morning wedding last year, I had a wedding tea reception with tea sandwiches and finger foods (a favorite was miniature apricot tea breads shaped like roses), tea punch, and a tea-flavored wedding cake. 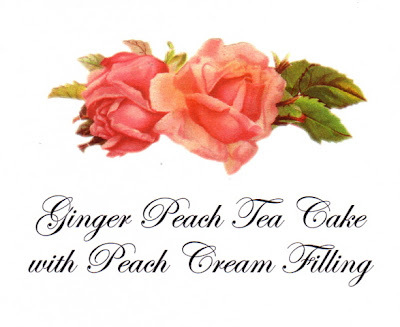 The vintage rose colored cake was flavored with Ginger Peach Tea and had Peach Cream filling. 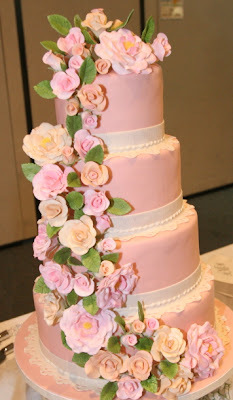 (It was important that the fondant color be "vintage rose" and not just "pink." Think Julie Roberts in Steel Magnolias: "My colors are Blush and Bashful.") Before I became a bride, I had always wondered about that tradition of freezing the top layer of the cake to enjoy on the first anniversary. With my own cake, I was certainly willing to try it. Never again will I have to wait an entire year just to eat a piece of cake! After the wedding last year, one of the many girlfriend angels who helped with the reception carefully packaged the top layer. It was in the freezer when I got home from our honeymoon, and for a year I have looked at it and wondered, "Could this possibly have any taste at all after being frozen for a year? Won't the fondant be reduced to powdery dust?" My husband and I spent last weekend at the lake house of some friends, and I had brought along the wedding cake since our first anniversary would be spent there. On anniversary morning, I got the cake out of the refrigerator where I'd placed it to thaw and carefully cut a slice. I got him to take the first bite. Well? He assured me it was still good, nice and moist, and I was so pleased. Thus began a tea and cake theme that has gone on all week. And to sip with that cake? 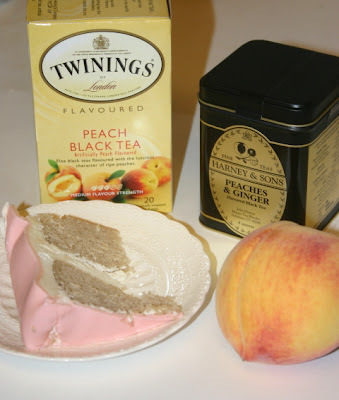 Harney's Peaches and Ginger tea and Twinings Peach Black Tea. (The Twinings tea, I was pleased to see, is now in a fully sealed wrapper, a la the Bigelow tea bags.) 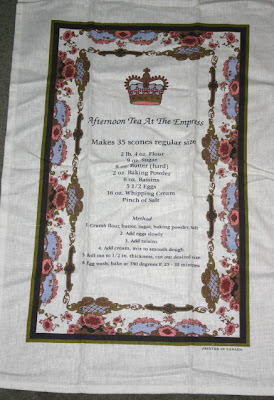 A piece of wedding cake and a cup of hot peach tea makes for an enjoyable, if very limited edition, teatime treat! 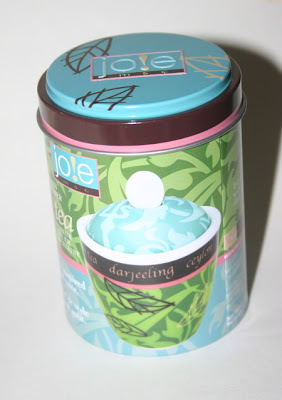 List your favorite tea & win our Giveaway!